‘Lining’ systems come in variety of formats but always comprise placing some form of Liner material inside the structure of an exisitng pipeline. The choice of which liner to use is dependent on the type of pipeline in question and the types and severity of the defects being overcome by using the liner. Each must be fully assessed as to its relevance to the project the in-hand. Lining solutions vary from a spray applied or hand applied mortar or resin (Insitu Applied Linings) through passing a new pipe into the old in either its original form or a modified form to make installation easier (Sliplining & Modifed Sliplining) to inversion lining techniques where a flexible material impregnated with a chemical compound is passed into the pipe line inflated and the resin cured to form the final liner (CIPP). Insitu Aplied Linings come in three main forms, Cement Mortar, Polyurethane (PU) or Epoxy Resin. In man-entry size pipelines these can be hand applied but in smaller diameter non-man-entry sizes they are generally spray applied. Until recently most of these spray linings have been appied in thin layers to the inner wall of, largely, pressure water mains that have experienced water colour and quality problems as, in general, the thin layer application (1 mm) is insuffiecent to seal against leakage. More recently however as water quality work requirements reduce in many areas, the manufacturers have researched the use of thicker application to work on leaking water mains. In 2004 one UK manufacturer had a system approved by the UKs DWI for potable water systems. The application utilises a 3 mm thick sprayed lining that does seal leakage in mains operating up to 10 bar pressure. So far some 85 k m of such lining has been successfully achieved. According to the manufacturer, the flexible 3 mm thick lining has properties similar to those found in PE liners. Another form of insitu applied lining is the Ferro Cement lining. Here a mesh support structure is normally constructed within the host pipe at the section tobe lined with this structure being inside a former of the required size. A special cement mortar is then applied to create the ferrocement structure. The system creates a WRc Type I liner once cured. Advantages of the system are that it can be used to repair discreet sections of a pipe such as the invert section only is this is where the pipe’s problem is as well as being suitable to complete ‘whole pipe’ linings. Sliplining in its basic form is one of the simplest forms of pipeline renovation. 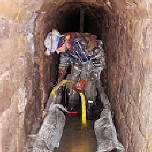 The process simply involves placing a new smaller diameter pipe inside the existing pipe. The obvious disadvantage of this is of course the loss of capacity that is inherent in such a process. This capacity loss may in some circmstances be mitigated somewhat by the fact that the liner pipe inner wall will have less of a friction coefficient than the host pipe so the losses may not be as great as first expected. Sliplining can be achieved using a variety of pipe materials including PE, PVC, clayware, concrete and GRP, where the latter three are normally jacked in in discreet sections. Another form of sliplining is Spiral Wound Lining, in its simplest form. Here a coil of PVC strip is wound by machine or by hand into a spiral to form a tube. The edges of the strip lock together to maintain the tube shape. The formed tube passes into the host pipe as would a normal length of PE pipe say. As with most simple sliplining renovation the liner pipe is then grouted into place within the host pipe with the grout being placed in the annulus between the host and liner pipes. A recent development has been the replacement of the PVC strip with a PE one. Another liner type that is considered to be a form of sliplining is the sectional liner. These are used in man-entry-sized pipes and comprise the installation of discreet, pre-formed liner sections that are assembled in situ in the pipeline that are, once in position, grouted into place by filling the annulus between the sectional liner and the host pipe inner wall. Liner sections are available in a variety of shapes and sizes, generally betwen 825 mm and 6,400 mm maximum internal dimension. Discreet lengths are usually between 0.5 and 2 m. The liners are normally classified as producing WRc Type I or II linings once installed. Sectional liners are, in the main, constructed of GRC, GRP or RPM materials and the liner dimension is normally governed by the minimum internal dimension of the host pipe. Given the rigid nature of the section, negotiation of bends may need special sections to be manufactured or the use of a flexible jointing material between adjacent section ends. Also because of the manual labour involved in the positioning of such liners etc construction rates are usually limited. Modified Sliplining is, as the name suggests, Sliplining lining with a difference. In modified sliplining the liner pipe is deformed in some way before being passed into the host pipe. It can be folded or squeezed in a die to reduce its nominal diameter to make it easier to push into the host pipe. The folded pipe is normally seen as a ‘U’ or ‘C’ shape whilst the squeezed (or Swaged) pipe simply has a smaller diameter that is retained by applying tension to the liner. Once passed into the host pipe, folded liners are reverted to their original shape using water pressure, or pressurised steam or air, whilst Swaged pipe can revert to its original size once the winching tension used to install it has been released. Spiral wound liners can also be classed as modified sliplininers if, as in some designs, the system is such that when the spiral has covered the length of the pipe, the end can be anchored in some way so that as the spiral continues to be formed the strip edging slips over itself. This allows the spiral to enlarge in diameter without extending in length. The process is continued until the outer wall of the spiral liner meets the inner wall of the host pipe. The advantage of all the modified sliplining techniques is that they are of such a design as to form a close fit lining to the inner wall of the host pipe. This minimises capacity losses (if there are any at all given the tight fit and smoother final finish) and eliminates the need to grout the liner annulus. As well as the liner types listed above, there are other system that sit in something of a category of their own. One is a system that is used to line pressure water mains using a factory folded polyester-reinforced polyethylene liner that is winched through the prepared host pipe. Steam is used to make the folded liner flexible and pressure applied to the steam allows it to revert to its original round shape within the host pipe, making it a close fit lining system. Another form of sliplining is the ‘Live Lining’ system used in the gas industry. This system allows the lining of an operating gas main without the need to take customers off supply. Special access glands and gas transfer heads are utilised in order to allow the liner pipe to be installed safely under gas pressure. CIPP has been around for over 30 years in one form or another. The earliest liners were formed of a non-woven felt which was impregnated with a thermosetting resin. Water towers were used to invert the impregnated liner into the host pipe and, once in place the water held the liner against the inner wall of the host pipe. The water was then heated to the correct temperature and this cured the resin. This forms the main installation process for most CIPP system even today. Linings of up to 2 m + diameter have been achieved in special circumstances but the diameter, depth and length criteria are normally used to design specific linings for any particular job. There have over the years been a number of different systems developed included ambient cure CIPP linings which tend to be used on smaller diameter shorter length installations. Liners of different material have also been developed with woven glass-fibre and others being amongst those available. The curing process has also developed along different routes with hot water and ambient cure being just two of a variety of options. UV light curing using UV sensitive resins and steam curing have now been introduced to the market. Systems are available from established named companies and increasingly as off-the-shelf proprietary systems from numerous independent suppliers. Installations techniques have also developed beyond the basic scaffold tower. Water installed systems now have a pumped system which enables the scafflod tower to be eliminated which is useful in difficult hieght access situations. Other systems, like UV curing, utilise compressed air inversion. In some systems the CIPP liner is not actually inverted into the host pipe it is winched through in a deflated state and inflated once in position using either water or compressed air depending on the system. The advantage of the inversion system however is that there is no relative movement between the liner and the inner pipe surface during installation and the impregnated surface of the liner does not drag over the rough pipe surface. In the winching system, the impregnated surface is exposed to such stresses through the winching process. The different curing process claim a variety of advantages. Heat curing claims to be useful in that the liner can be impregnated off site and, when correctly transported, can have a significant shelf life before installation has to be achieved. Ambient cure systems have the advanatge that they need no separate heat or power source to enable curing to take place. But they do have a limited shelf life once impregnatuion has been done before the resin will harden of it own accord. UV curing claims to eliminate certain disadvanatges of both these systems in that impregnation can be achieved off site whilst not requiring a major heating unit to achieve curing on installation. Steam curing also claims to have advantages over all of these in that off site impregnation be be done, the site footprint is relatively smaller than most other options and the use of steam reduces the styrene production during the curing process making it economic and environmentally friendly. Each system has advantages and disadvantages and each should be examined on its individual merits before a choice is made for any particular project. As with most long length renovation lining systems there is a call,once the liner is in place, to reopen lateral connection. This is normally achieved using remotely operated cutting robots. The position of the lateral is plotted using the information from the prelining CCTV survey. In recent years there have been questions raised about how well the reopen laterals seal and whether they allow infiltration to continue into a repaired pipe at the lateral connection, or whether they allow exfiltration along the annulus between the liner the and the host pipe. In an effort to overcome this problem several companies have developed means by which these points can be sealed. Some use tehcnology discussed in the the ‘Renovation – Repair’ section of this guide with similar technology to the resin sealing packers. Others have developed a connection seal known as a ‘Top Hat’. The Top hat is installed from inside the main pipeline after lateral reopening. As the name suggests the seal is an inverted T shape with the body of the T being placed into the lateral and the ‘Brim’ being sealed against the lined pipe wall. Such a seal claims to effectively seal the liner from any infiltration and prevent loss through the lateral joint. Localised repairs can also be achieved by using most CIPP technologies. In this case the inflateble bladder technique is used to position a short liner length over a known defect where it is then cured in place. This is of course a much cheaper option than manhole-to-manhole lining where only a few specific defects exist over a length of pipe. A recent develoment in CIPP lining has been a system where the liner is inverted into the host pipe without prior impregnation. The resin is applied directly to the host pipe wall ahead of the advancing liner to ensure that both the defects and other inconsistancies in the pipe wall are fully filled before the liner is put in place. The advantage of this system is that the stresses on the liner during inversion are much reduced.